"My child grinds their teeth at night, what should I do?" I get this question all the time. In adults it is often called Bruxism. It seems most preschoolers grind their teeth (at least according to their parents). I also see it a lot of this with babies trying out their new teeth. 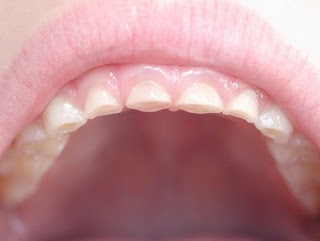 Bottom line, it is usually not a big concern for baby teeth.Teeth grinding in children seems to be very common. Sometimes, continued grinding (usually at night), can cause abnormal wear of the teeth, sometimes it does not. When it does, I usually see flattening of the baby teeth almost if you had placed them on a sander. Sometimes it can look like back teeth in the photo here sort of like a bowl shape. Sometimes there are associated factors that might aggrivate the situation like esophegeal reflux causing erosion of the enamel. What to do? Well, even though it sounds awful and eventually can look funny, there is not much you can do. More importantly, usually there is really no need to do anything. As the enamel wears away the teeth flatten out, the dentin (inside more yellow layer) wears away even faster, sometimes leading to funny looking teeth like in the photo. It does not hurt as the pulp "scars" back out of the way about as fast as the kid grinds away the tooth structure. By the time you would see real problems due to lost tooth struture, the teeth naturally fall out. Very few cases I have ever seen where we needed any kind of restorative treatment or extraction. What about a night guard? I might consider such a thing in adults who are grinding and doing damage to permanent teeth, that is more of a concern, but in kids-no. You would have to remake the thing so often due to growth and the kid would never wear it. Plus, like I stated, there is no real benefit. "But the noise is driving me crazy!" 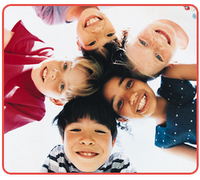 First, get your pediatric dentist to take a look to make sure what is going on. If everything is ok, the grinding will likely reduce and most of the time go away by the time the permanent molars settle in around 7 or 8 years of age. Oh, a good set of earplugs for the parents does not hurt. My 5 year old son has been griding his teeth. When we last saw our dentist 4 months ago his two front teeth were white, but they were very small from the grinding. Our dentist stated that they were ground down to the nerve but did not say anything further other than he would see us back for the 6 month check up. The dentist stated that he was not worried about the grinding of the baby teeth but stated if this happens when he is older that he will most likely need a mouth gaurd. My question is this....My child's teeth have gotten darker and are now grey in color, he is still not complaining of pain they just look awful and very dark, and the nerves on the inside/underside of the teeth even look dark now. Is this typical to see with teeth grinding or could there be a bigger problem now? Any advice you have would be greatly appreciated. I don't know, but as teeth are "ground down" the inner layer or dentin is a little darker, also the pulp becomes somewhat visible (pink if the dental light shines on it). Otherwise, I do not know exactly.--"Very dark" sounds unusual-of course ask your dentist about the darkness. 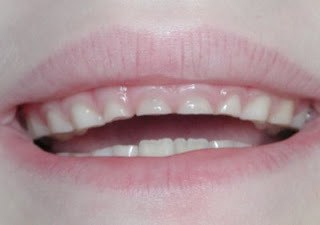 Teeth grinding (brixism) in children and indeed adult alike is all too common. we always have to be careful though to see if the problem is really ground down teeth or just short teeth. My 18-month-old daughter grids her teeth, which probably caused her upper central and lateral incisors on the left to be out of the line. Is it possible? What could we do about it? Does it effect her permanent teeth lining? In my experience doesn't affect perm teeth..can look funny though. This is a related/unrelated question. My 3 year old son I think did some grinding of teeth but since he had his tonsils and adenoids out in June, it has stopped and he sleeps so much better. BUT, he was and still is somewhat a mouth breather. 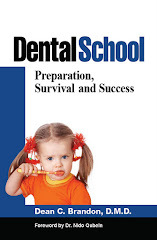 When he was 2 we discoved at his first dentist visit that he had caries on hsi front teeth and several other back teeth. Totally devasted. Our dentist tried to fill but referred us to a ped dentist. So last fall he had all the work done, we were relieved, etc. He went for his July check up (7-8 months later), and he has excessive decay in the front teeth (all four) plus needs 6-8 crowns! We are devastated. This child drinks no juice, never has had candy, has had soy milk because of a dairy allergy (switched to lactose free milk), and eats his fruits and veggies! The ped dentist only does mild sedation and refers extensive cases to the children's hospital in our city requiring GA (this is Canada - universal health care but long waits). Due to some exageration of details, I was able to get my son in to the hospital for an assessment quickly. They feel that the four front teeth will have to come out - when we pressed for root canals, they said they will try but cannot be assured until they get in there if thsi will be possible. Now we are waiting for a surgery date - which could take up to 6 months! He is in high risk of loosing these teeth the longer we have to wait. Is it worth the risk to find a dentist who will do full sedation in order to have these teeth saved - or is that too risky? Teh children's hospital environment is much more to my liking but I am so worried that waiting for the surgery date will undoubtedly see the teeth having to be removed or absesses occuring. Most three year olds with extensive treatment needs (as your child eveidently requires) I usually reccommend the OR for general anesthesia. Sometimes work can be completed in the office wiht consicious sedation, but may require multiple visits. There is a lot here on the blog about sedation, hospital cases, rampant extensive decay, etc. Yes, things can get worse with time. I cannot recommend anything particular other than to get a good pediatric dentist. Of course, I cannot comment on wait times other than to say here the average time to get into the OR is usually a few weeks or even a few days. Most of the time that kind of wait does not change the treatment plan. Sometimes parents choose not to get timely treatment and then after 6 months the treatment needs are more extensive. Best of Luck. Thanks Dr. Brandon for your timely reply, most appreciated. I have enjoyed your blog. It is very informative to a mom of 3. I found it researching permanent teeth coming in behind baby teeth. My 5 yo bottom teeth both fell out yesterday. I noticed that the rt. tooth has started coming in behind her where her baby tooth was. Now to the grinding. MY dd had both front teeth extracted last October after she developed an abcess over them. I felt horrible. I knew she was grinding and had mentioned to my family dentist(asked questions etc). Well suddenly we woke up one day and my 4 yo looked like a mouse. I looked it and was alarmed at what I saw. She was seen the next day by a Pediatric Dentist/Orthodontis. She had Grade 4(whatever that means).She was surprisingly cooperative and let them do xrays. She had no cavities. She was placed on antibiotics and 10 days later the teeth were extracted. She is still grinding her teeth. However, none have gotten as short as her 2 front teeth. I think her other teeth falling out will help for an interval. He has advised me that she will require orthodonistry for her underbite which contributed to her grinding. All of her front teeth meet each other. He feels some of this will correct as she ages. My 8 months old baby, got his upper incisor chipped. Now the black color nerve comes out. He seems to be not painful and did not even cry. Should I have a root canal for him right now? I'm worried about he's too little to receive the treatment. Could you give me some suggestions? A traumatized/chipped tooth can get worse and have problems. 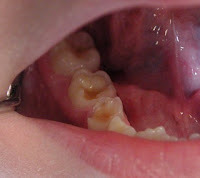 I suggest you reading my post on My childs tooth is turning dark! and other posts regarding treatment of young children. Good to have a pediatric dentist take a look. I am curious how early can kids get their permanent molars? My daughter is 4 and has 20 teeth currently and has 4 new ones coming in, two have already broken the skin. They are at the back of her mouth. We have an appointment for the dentist next week, but would love some idea of what's going on. She also has a condition called WAGR (wagr.org) and from that had a year of chemo.. not sure if there is any tie between this and that, but thought it was worth mentioning. I have seen a lot of variation in molar eruption. A chart will say something like 6-7 years of age, thus the 6 year molar slang term. However, I have seen lots of 5 year olds and a few 4 year olds curtting thier 6 year molars. Of course ask your dentist to be sure. I often joke that a childs teeth are older than they are! Thanks for posting this article. You know exactly what we want to know. I personally hate the grinding noise. So I always wake my sister up when she does it. Looks like if the grinding doesn't stop, all teeth will look fallen out. My 10 year old grinds his teeth at night and the ortho dentist said the tooth enamel has been removed. Appliance for this problem is $1,045.00:( Is this a normal price? Appliances may help but I don't do many on kids with a mixed dentition. (younger kids like under 13). There are all kinds of retainers, appliances and guards. Hard to say but that sounds like a lot to me. Of course you are not paying just for a device you are paying mainly for time, followup etc. Some apiances do more than one thing. My five year old has recently begun grinding his teeth at night. It appears he only does it when he is concerned about something. Could stress be a related factor? Stress can certainly be a contributing factor in many cases. What about worms in the stomach causing teeth grinding? Haven't really heard much about that. Our dentist recommended that my 7 year old son wear a night guard due to teeth grinding - he is concerned about his molars. What do you think about the over-the-counter night guards? The price is over $300 and it is a lot to us. Over the counter ones are ok, but the one's a dentist can make are more custom fit and more comfortable. I usually don't make night guards for young children. We sometimes do for older teenagers. Hi DR, i had recently took my 5 yr old for his 6 month check up and cleaning and the dentist told me that they would have to put like a filler on top of his teeth because the grinded the top enamel of his teeth. he doesnt complain about any sensitivity to cold or hot sensations. Is the any need to put a layer of any sort on his teeth. I don't usually place a filling or anything like that unless there is decay. On rare occasions one might (or a crown if indicated) if there is a lot of breakdown that might cause loss of space or shifting. Now we do often place preventive sealants on 6 year permanent molars. That is a great preventive treatment. It's not for grinding though. My 5 yo son grinds and has short teeth. He fractured one of his premolars and they did a root canal due to pain. They recommended risers to prevent further tooth damage. He goes to a pedi dentist. Any thoughts on risers? He won't be able to bite down completely but they said it would help with the adult teeth coming in. I presume when you say "risers" you mean composite buildups to open the bite. That could be useful in some cases to allow eruption of permanent teeth in a better position. I wold not be too concerned on a 5 year old however. That is, I haven't seen a case where it would be that helpful at that that young an age. However, there is some logic behind it if timed well. As you can read, there is not much to be done, but there is also very little to worry about. Many 7 year olds have wobbly teeth as some are ready to exfoliate (fall out).